has on display a sampling of prints and lithographs from the permanent collection. 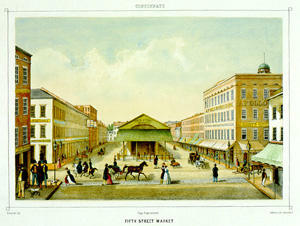 Pictured here: Fifth Street Market by Onken's lithographic firm. The Fifth Street Market opened in 1829. It was the center of the meat-packing industry in Cincinnati until 1870 when the site was selected for the Tyler Davidson Fountain given to the city by Henry Probasco. Located in the Cincinnati Museum Center at Union Terminal, the Library is free and open to the public, Monday-Friday, noon-5 p.m. and Saturday 9a.m.-5 p.m.